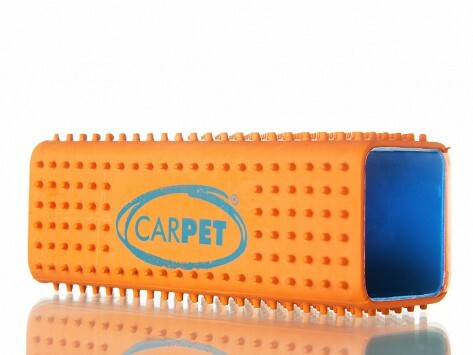 This rubber block has nubs on the surface to lift, gather, and remove pet hair. Pet hair, fluff, and fuzz gathers on the block with minimal effort and is easily lifted away. Worked great at getting all of the dog hair off the fabric covered ottoman! Compact enough to store in a kitchen drawer or a car glove compartment, you’ll want to keep several handy. CarPET cleans easily after use with a quick rinse under the faucet.